Friggin’ WOW!! That’s incredible. And the scary thing is, the chart makes it look not that hard. 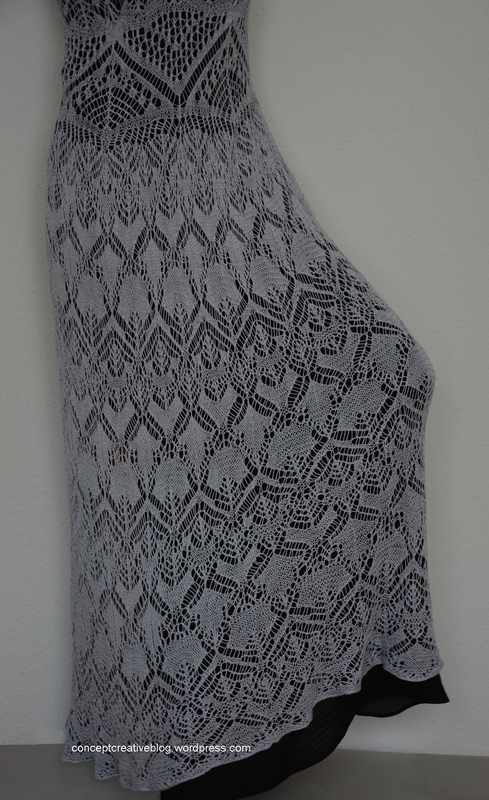 I get sucked into lace projects by deceptive charts….. It takes lots of time, but otherwise it’s doable :)). Thank you very much for the purchase. It is a real pleasure that you love my work. 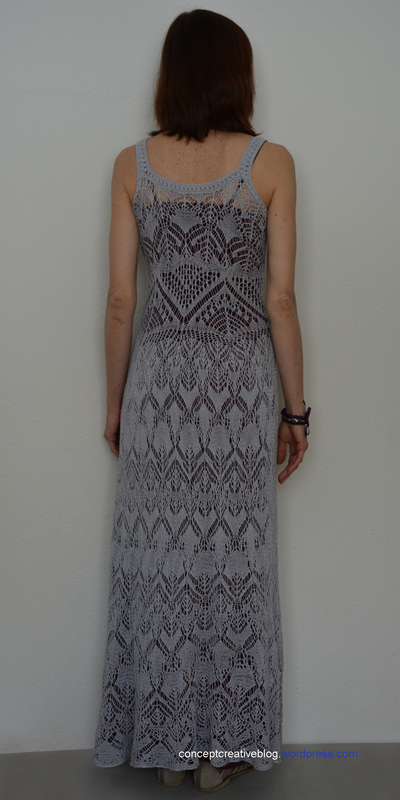 I offer this maxi dress as a written pattern and have described it during working on the project. For grey dress I drew this free skirt chart As I have explained in the previous comment that the pattern for the top was made of at least two different charts. Here is chart that I have used over waist: http://imgbox.com/axeIROkZ Over it I knitted several rows from the skirt chart or maybe included some rows from another chart in between (don’t remember) – these were rather experiments because I had not any exact plan in mind and made what would look good (in my opinion : )). Then I undid several upper rows because the dress became too long. I left no notes in my papers related to the top of the dress … except for the above photo-chart for waist level. Alas, knit patterns are not very popular in my shop and I prefer to concentrate on crochet patterns. Hope that you will find this free chart for the skirt useful and can make a beautiful dress (or skirt) for your wife. You just need to recognize these chart symbols https://conceptcreativeblog.files.wordpress.com/2015/01/skirt-chart-abbrev.jpg and repeat motifs across the round. Happy knitting! Thank you very much for the interest. This dress was made a while ago and I’m not going to describe it. The pattern for the top was made of at least two different charts. I found chart that I used over waist and took a photo: https://conceptcreativeblog.files.wordpress.com/2018/02/over-waist.jpg Chart symbols: https://conceptcreativeblog.files.wordpress.com/2015/01/skirt-chart-abbrev.jpg Over this piece I knitted several rows from the skirt chart or maybe included some rows from another chart in between (don’t remember) – these were rather experiments because I had not any exact plan in mind and made what would look good (in my opinion : )). Then I undid several upper rows because the dress became too long. I searched for some notes in my papers but could not find any related to the top… except for the above photo-chart for waist level. Hope it helps. 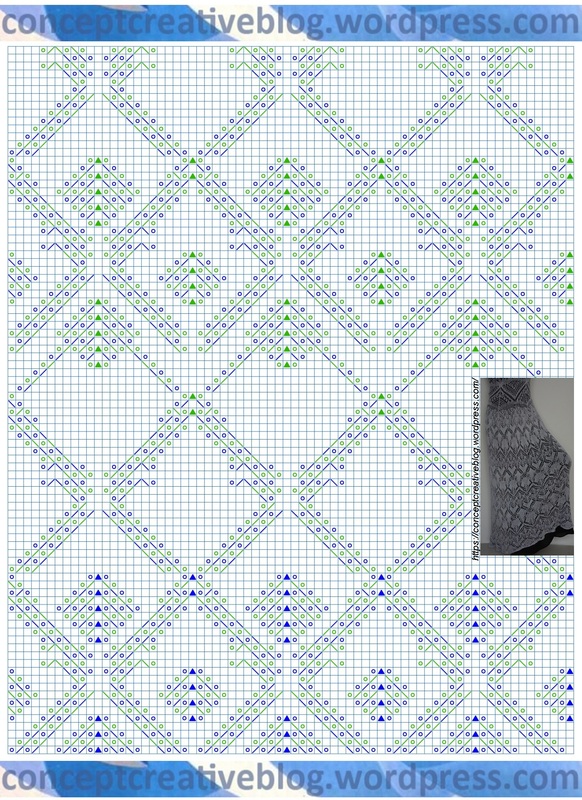 And from there you can experiment with this skirt chart https://conceptcreativeblog.files.wordpress.com/2015/01/skirt-chart.jpg but work more lacy rows (not solid ones).